The Aeris is the product of a close collaboration between Jeff Rowland Design Group and Holm Acoustics, a Danish company founded by Thomas Holm that specializes in signal processing products for high end audio applications. The Aeris is much more than the successful result of a synergistic collaboration between the two companies. The high degree of complementary synergy between the two teams working in parallel can only be defined as a case of true organic design. 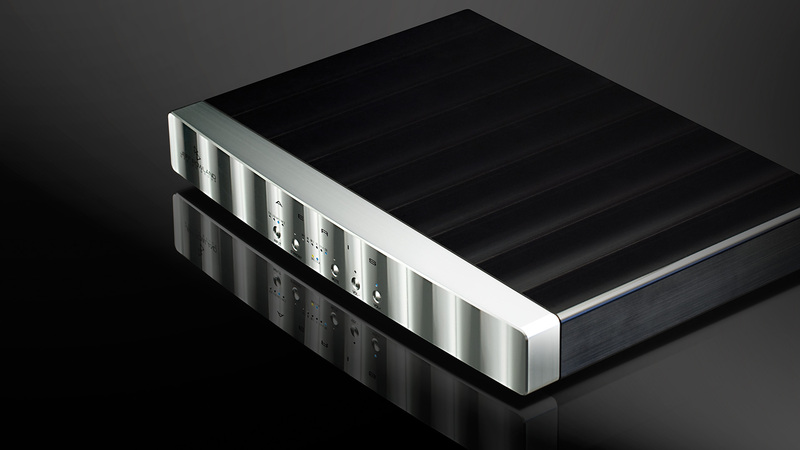 Balanced preamplifier design housed inside twin ultra-low resonance, structurally rigid chassis precision-machined from solid ingots of aircraft grade 6061-T6 aluminum, completely sealed for trouble-free operation, yield maximum electrical/EMI/RF isolation. Matching front panels precision-machined and sculpted with a diamond tipped cutting tool into a uniquely elegant prismatic curved design. Power supplies and microprocessor-based system control circuits confined inside control chassis. Sensitive audio circuits isolated in audio chassis. Left and right subsystems further isolated into individual milled Aluminum pockets in true dual mono design for ultimate RF and EMI shielding. Control subsystem taken completely offline after each command execution to maximize sound purity. High speed switch mode power supply (SMPS) developed for aerospace applications incorporates passive power factor correction (PFC) for sonic performance so pure and musical that is virtually invariant to power cords. Circuits implemented on military-grade 4-layer ceramic boards for minimum energy retention. Boards further sport numerous grounding points for extended internal star-grounding. Gain stages based on ultra-low noise advanced TI Burr brown OPA1632 differential balanced audio amplifiers are implemented into shortest signal path of any Rowland reference preamplifier. Separate 2nd gain stage for record outputs sports own OPA-1632 modules and independent volume. All inputs and outputs coupled to identical custom wound Lundahl transformers for maximum noise rejection and cross-component compatibility. Transformer coupling also ensures invariant gain for balanced and unbalanced devices. Flexible connectivity: 6 inputs (4 XLR balanced, 2 RCA unbalanced); 4 main outputs (2 XLR balanced, 2 RCA unbalanced); 2 record outputs (1 XLR balanced, 1 RCA unbalanced). Hi resolution independently programmable gain offset on each main input ranging from -10dB to +10dB in 0.5dB increments–. Output offset: hi resolution programmable gain offset on main unbalanced input 2 with 0.5dB resolution. All main input configurable as unity gain bypass for compatibility with theater processors. Independent signal phase inversion control on left and right channels for optimum speaker setup and system checks. Hi resolution (1.0dB) panning of stereophonic image (channel balance) for a maximum +/-20dB shift. Long life graphic vacuum fluorescent display (VFD) for system control. Remote control: Highly ergonomic, custom remote control transmitter milled from Aluminum billet supports complete system control and duplicates front panel operations. Wired remote sensor milled from Aluminum billet enables Criterion’s control while housing preamplifier in closed cabinet enclosures. Dual rate volume control allows precision level adjustments over nearly a 100 dB range. The volume control incorporates a permanently noiseless optical encoder that always maintain its tactile feel, accuracy, and channel balance at all settings. The volume can be adjusted from 0dB to 99.5dB from the multi-role control knob on the front panel, as well as from the multi-function remote control. Rapid turns of the control knob adjust the volume by 1.5dB increments. Slow turns of the control allow for very fine adjustments by 0.5dB increments. Rocker switch on back panel coupled to timer relay, turns Criterion quietly on to full power after circuit test and stabilization. Grounded 15 Amp female IEC AC power connector. Highly efficient circuits yield modest power consumption of mere 50 Watts in class A, resulting in cool operations, and permits constant power-up to eliminate warm-up time and maximize musical performance. The Corus can operate also enclosed inside an entertainment unit. USB interface is plug-n-play with all operating systems, including PC, Mac, or Linux.